The launch of a SpaceX Falcon 9 rocket (shown here) and its DSCOVR space weather satellite payload was delayed on Tuesday, Feb. 10, 2015 due to unacceptably high upper lever winds over its Cape Canaveral Air Force Station launch site in Florida. It was the third delay for the launch this week. There will be no rare spaceflight triple play for SpaceX today (Feb. 10). High upper-level winds scrubbed today's planned launch of the DSCOVR space-weather satellite, which was scheduled to blast off atop SpaceX's Falcon 9 rocket from Cape Canaveral Air Force Station in Florida at 6:05 p.m. EST (2305 GMT). As part of the flight, SpaceX will also try to bring the Falcon 9's first stage back for a soft landing on an "autonomous spaceport drone ship" in the Atlantic Ocean, in a daring test of reusable rocket technology. Developing reusable rockets is a key priority for SpaceX, which seeks to slash the cost of spaceflight. Meanwhile, SpaceX's robotic Dragon capsule left the International Space Station today, wrapping up a monthlong stay at the orbiting lab. The spacecraft, which is loaded up with 3,700 lbs. (1,678 kilograms) of scientific samples and other cargo, is slated to splash down in the Pacific Ocean off the coast of Baja California around 7:45 p.m. EST (0045 GMT Feb. 11). 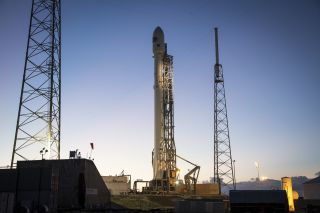 "Launch postponed to tomorrow due to high winds at the Cape, but Dragon still inbound from orbit in 90 mins," SpaceX's billionaire founder and CEO Elon Musk said via Twitter shortly after the DSCOVR launch scrub. The $340 million DSCOVR mission (short for Deep Space Climate Observatory) is a joint effort involving the National Oceanic and Atmospheric Adminstration, NASA and the United States Air Force. The spacecraft will set up shop at the Earth-sun Lagrange Point 1, a gravitationally stable spot about 930,000 miles (1.5 million kilometers) from Earth, then keep an eye out for powerful solar storms that could potentially disrupt power grids and satellite operations. The DSCOVR launch won't mark the first time that SpaceX has tried to land a Falcon 9 first stage on a floating ocean platform. The company first attempted the maneuver during Dragon's launch on Jan. 10, and nearly pulled it off — the rocket stage succeeded in hitting the drone ship, but it came down too hard and exploded, perhaps because the stage's stabilizing "grid fins" ran out of hydraulic fluid. The DSCOVR satellite's deep-space destination will make the upcoming attempt even more challenging, Musk said. "Rocket re-entry will be much tougher this time around due to [it being a] deep-space mission," Musk said via Twitter Sunday (Feb. 8). "Almost 2X force and 4X heat. Plenty of hydraulic fluid [though]." The DSCOVR launch and rocket-flyback maneuver were originally scheduled for Sunday, but a glitch with the Air Force's radar-tracking system scuttled the attempt. The launch try was then pushed to today because of weather concerns. Visit Space.com on Wednesday for complete coverage of the SpaceX's DSCOVR satellite launch and rocket landing attempt.